Delia Rosa Samardzich, age 90 of Hammond, passed away entered the gates of heaven on Wednesday, December 5, 2018. She is survived by her beloved children: Tomislav (Maria) Samardzich, Miro (Mary Grace) Samardzich, Milovan (Gloria) Samardzich and Rodimir (Illiana) Samardzich; 7 grandchildren; 2 great grandchildren; Siblings: Enrique, Yolanda, Oswaldo, Carlos, Alberto, Juan and Cesar; many nieces, nephews and good friends. Preceded in death by her beloved husband, Bozidar Samardzich and parents, Sebastian Mucha and Juana Urbina. Funeral Services will be held on Monday, December 10, 2018 at 11:00 a.m. at Bocken Funeral Home, 7042 Kennedy Avenue, Hammond (Hessville) with Pastor Orlando Soler officiating. Burial will follow at Oak Hill Cemetery in Hammond. Friends are invited to meet with the family for a time of visitation on Monday morning December 10, 2018 from 10:00 a.m. until 11:00 a.m.
Delia was born in La Oroya, Peru, South America. She has lived in the Calumet area since 1955. Delia formerly attended Primera Iglesia Christiana in East Chicago where she was involved in the Ladies Society among other ministries. Delia enjoyed spending time with her family and friends, sewing, crocheting, gardening and cooking. 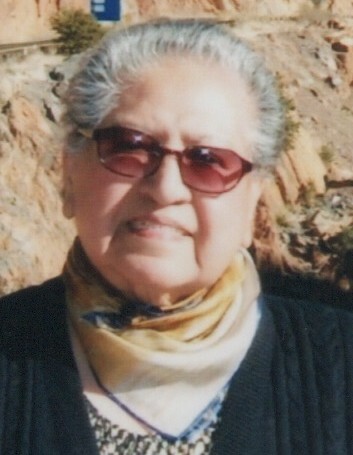 She was a loving mother, grandmother, great grandmother and friend who will be dearly missed.